Cretia's Bake Shoppe & Eatery started as a bakery but is now a full service restaurant in the Bishop Arts District in Dallas, and I'm so glad they expanded because our December brunch at Cretia's was wonderful. They truly rolled out the red carpet for this month's Dallas Blogger Brunch! From appetizers, to specialty drinks, to a Dallas Blogger Brunch custom cake, we loved everything on the table. If I may make a personal recommendation: order the White Chocolate Blueberry French Toast. You're welcome, in advance. December is full of holiday activities and I couldn't resist using brunch as an opportunity to give each blogger a small gift for coming to brunch. I wrapped small boxes of 2 macarons each from Savor Pâtisserie and also used them as place cards. The adorable gift tags were made by talented modern calligrapher, Caddy Jurica, of Caddy Corner Designs. 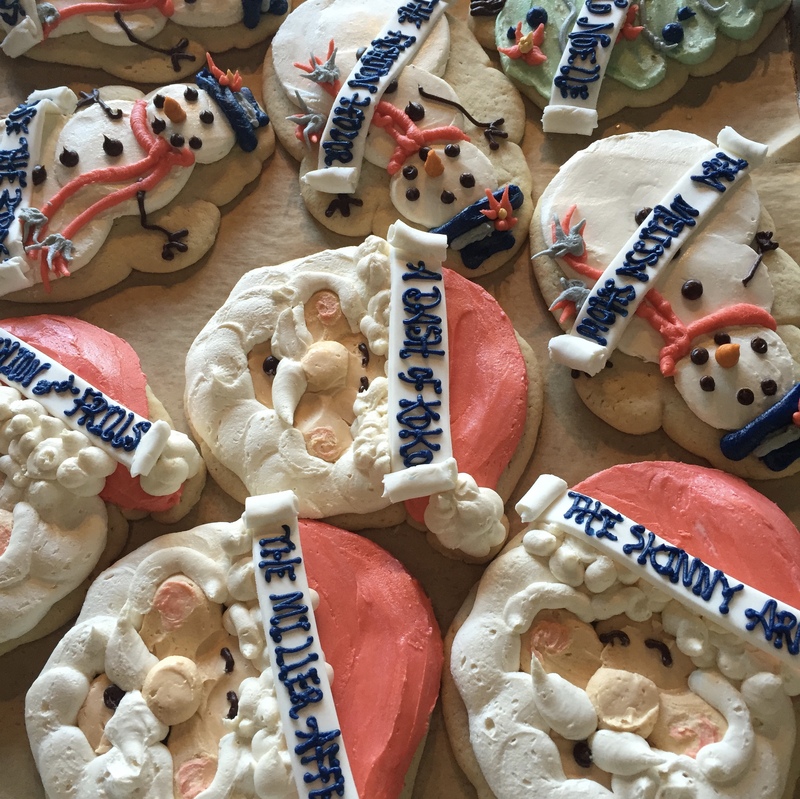 Cretia's is probably best-known for their cakes and bakery items; they surprised us with a tray of the most adorable and delicious personalized cookies! They went above and beyond to make our brunch special; most of us had never eaten at Cretia's before, so we were blown away by the amount of thought that went into their brunch preparation. These cookies were as delicious as they are cute! When I go to restaurants I usually don't order an appetizer because I get too full to finish my meal as it is. 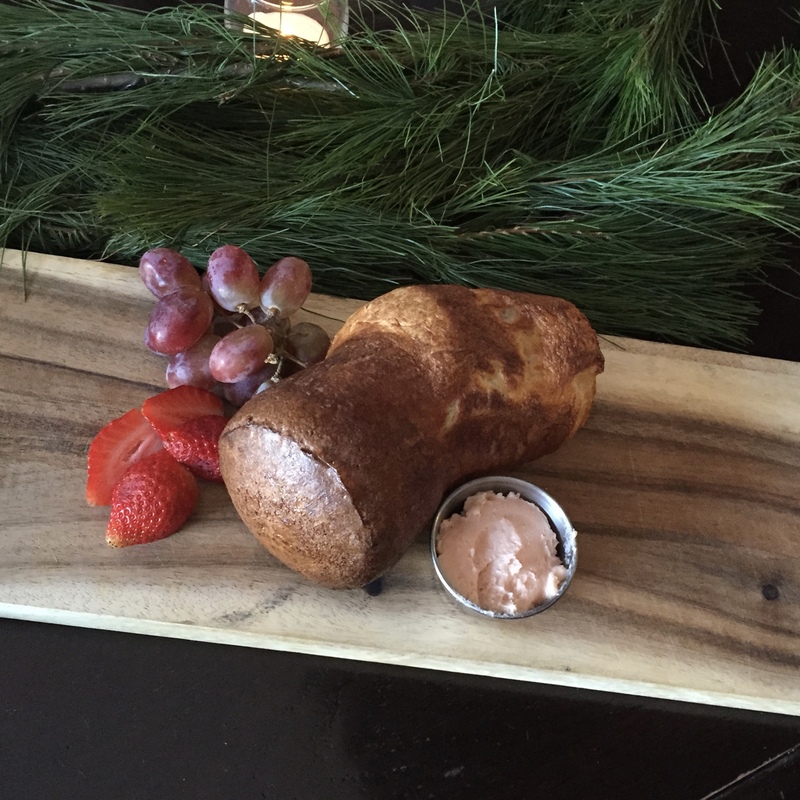 However, this popover was the most amazing melt-in-your-mouth bread ever, complete with strawberry butter. You HAVE to order this. I tried to use the butter sparingly, but it was so good- I mean, it's butter, so of course it was good! You know by now that I am a sucker for fancy french toast; if there is french toast option on a brunch menu, that's what I order. Every. Time. I think Dallas Blogger Brunch is the only time I order something this fattening and delicious, so I'm ok with a splurge every now and then. Let's just talk about how this White Chocolate Blueberry French Toast was completely worth it. White Chocolate + Blueberries. Together. It was magical. All of the girls enjoyed our time at Cretia's; the food and the service were both fantastic. A special surprise about Cretia's is that the entire storefront is made of sliding glass doors, so during our meal they opened the sliding doors and the weather was beautiful; it felt like al fresco dining at it's finest. Overall, Cretia's new brunch menu hit all the right notes, and it should definitely be on your "must try" brunch list in Dallas. I always tell people I meet who are new to Dallas to look at my Dallas Blogger Brunch restaurants because they are truly some of the best and Cretia's proved that yet again with their impeccable service, lively Bishop Arts location, and delicious menu! 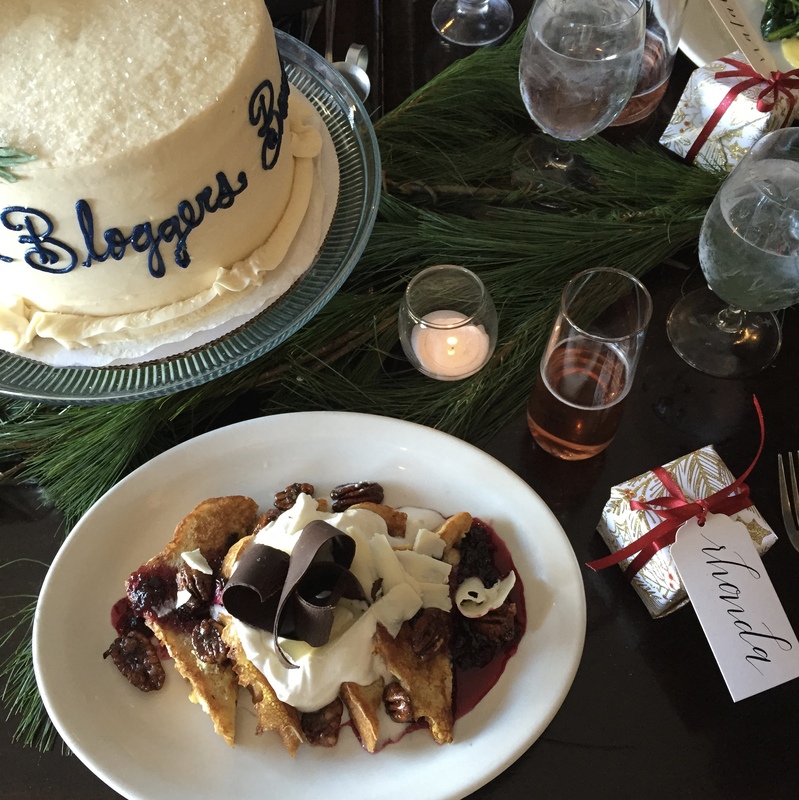 Thank you to Cretia's for hosting December's Dallas Blogger Brunch.